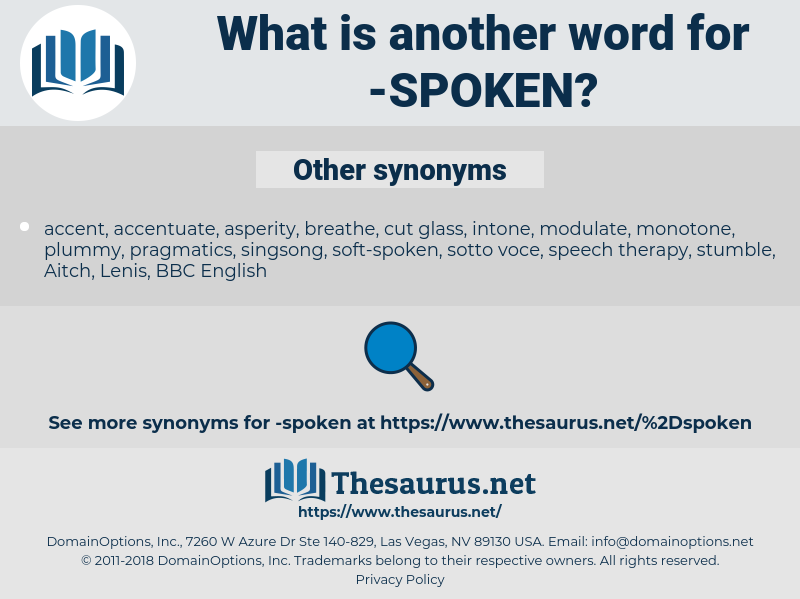 What is another word for spoken? Characterized by a certain manner or style in speaking; often in composition; as, a pleasant-spoken man. address, addressed, Talked, spokento, acknowledged, elapsed, Investigated, Negotiated, articulated, Discussed, Existed, Intervened, spent, Phrased, Communicated, Asked, Criticised, pronounced, Explained, observations, presented, demonstrated, incorporated, characterized, emphasized, Perpetrated, advised, Examined, understood, practised, Advocated, emphasised, Issued, specified, described, illustrated, Accommodated, preferred, Translated, criticized, represented, voiced, Debated, preserved, accepted, recognised, interrogated, publicised, engaged, anticipated, Passed, professed, Explored, Operated, reported, Perpetuated, Mentioned, written, measured, Manifested, spread, considered, asserted, endorsed, Pleaded, Pled, declared, Responded, witnessed, Cooperated, talkedto, perceived, assumed, Disseminated, publicized, Adjudicated, Delivered, Consulted, standardised, accomplished, heard, mistaken, pressed, distributed, Complained, interviewed, read, Performed, handled, Managed, organized, transmitted, engagement, supported, pursued, Tackled, published, practiced, observed, Argued, repeated, Transferred, Answered, Undertaken, recognized, raised, Caught, expanded, terminated, exposed, circulated, Appeared, Indicated, intervention, disclosed, pledged, valued, announced, admitted, Exercised, Denominated, Denounced, attended, portrayed, sought, Invoked, suggested, Alluded, risen, shouldered, shared, posed, phoned, Spilled, Championed, Enshrined, referenced, broadcast, supposed, revised, Embraced, dissolved, condemned, Worded, Suffered, sat, kept, imposed, invested, cast, concluded, recalled, Appealed, finalized, activated, used, diffused, Happened, sustained, disposed, imprisoned, dispatched, Displayed, Deployed, Enacted, related, Introduced, qualified, S, cultivated, campaigned, settled, Defended, Been, aroused, calculated, formulated, resolved, revealed, contacted, response, employed, Confronted, conducted, elaborated, Contributed, Deliberated, Rendered, utilised, disputed, informed, Expounded, executed, structured, clarified, reacted, depicted, reflected, proved, proven, verbale, Replied, underscored, aired, assisted, recommended, removed, enforced, changed, Targeted, Exhibited, released, Cited, alleged, Looked, Chatted, Sentenced, outlined, Demanded, governed, processed, Voted, Forwarded, sent, placed, Helped, Enjoyed, seen, identified, involved, Provided, dismissed, Revoked, determined, Quoted, Stepped, corrected, Resorted, permitted, Offered, charged, Preceded, documented, utilized, Served, included, Reared, treated, Questioned, taken, seized, improved, reminded, uttered, Filed, donated, Steered, Weighed, received, Nurtured, stretched, devoted, Pushed, Insisted, Generated, Borne, embodied, marked, Promoted, Broadened, retained, Summoned, Waged, Submitted, Achieved, concerned, evoked, exploited, Encountered, applied, faced, highlighted, directed, handed, Detained, Decried, advanced, Contended, defined, featured, tabled, Gained, held, Watched, granted, obligated, decided, Cared, Emerged, listed, reviewed, Entered, promotion, secured, Approached, signified, Carried, called, divorced, Undergone, given, maintained, experienced, reinforced, noted, Echoed, Worked, Reached, remembered, known, contained, Upheld, obliged, Obtained, turned, Picked, ordered, Termed, extended, Emitted, Had, Urged, joined, required, Surveyed, nourished, Dealt, stuck, Wagered, Fished, serviced, moved, geared, bet, framed, broached, fostered, relieved, felt, ruled, decreed, Resulted, guided, played, requested, Erected, Signaled, signalled, opted, underlined, pointed, Aimed, laid, touched, Remained, effected, led, convicted, Levelled, covered, continued, jailed, Claimed, expected, intended, drawn, mailed, Boarded, Shown, showed, fulfilled, Notified, focused, fuelled, Acted, put, arrested, Launched, Occurred, Polled, headed, driven, Incurred, unveiled, Viewed, Allowed, lifted, Fought, doomed, Hinted, noticed, Yielded, run, Couched, Brought, bound, found, Meant, Tended, gone, built, Met, made, me, thought, done, named, cut, talk, talking. speakers, Participated, expressed, Referred, stressed. mute, unsaid, explicit, voiceless, Nonvocal, silent, surd, quiet, paper, formal, unuttered, cursive, backhand, inarticulate. No one has ever spoken to her. The last word is spoken. 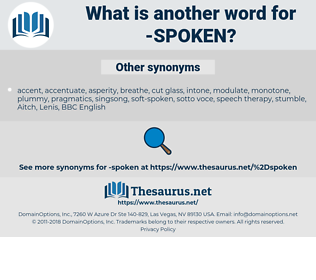 spasm, spokesman, subjoin, sapphism, soupcon, Sufism, sophism, subocean, sivaism, sphagnum, specimen, subsume, suspicion, suffusion, spaceman, scyphozoan, shivaism, sheepskin, spokeswoman, spokane.